I’m not one for line-ups if I can avoid them. I’m prepared to dine at other eateries and let the two hour wait craziness subside at the latest and buzziest. Usually this takes a few weeks and I don’t get to write the hot take or first look posts. However I do get the benefit of a kitchen that should have worked out any kinks and have settled on the standard that they will be executing their food. Sanpoutei in Richmond was a ramen-ya I had tabs on. After 4 months since their open, I was able to breeze in at 6pm and claim two spots at their square communal counter. Joining me was Speedy and because she forgot to remind me, I only took pictures of my food and not hers. Despite only trying one ramen, I’m fairly certain Sanpoutei has the foundation to be a great Ramen house in YVR. Although Vancouver is far from peak ramen, the ramen scene is starting to become competitive and this requires shops to offer a more unique value to discriminating noodle slurping customers. Sanpoutei simply have done so by simmering a broth that is distinct. Basically it’s not the same tonkotsu broth almost everybody is peddling. The soup I sipped in my Niigata Shoyu Ramen was umami rich, subtly sweet and salty from the shoyu and lastly had a dried seafood flavour. 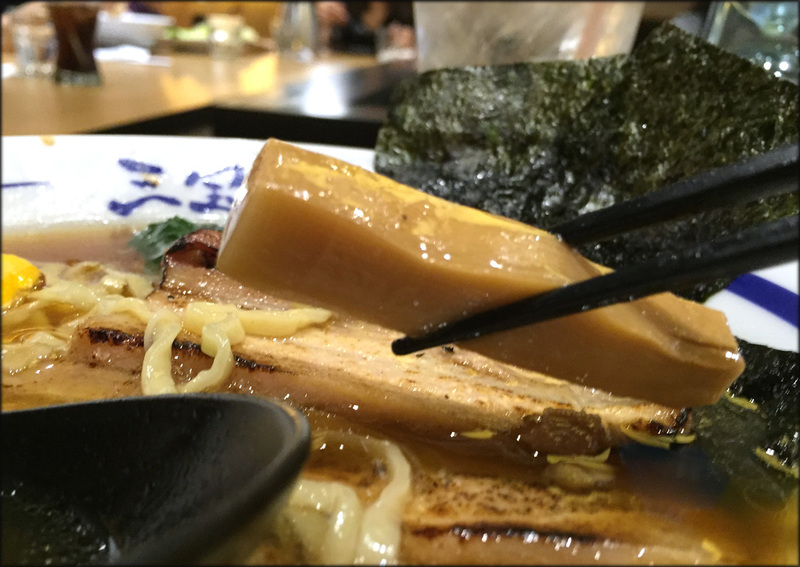 What was absent was a heavy meatiness or a collagen aftertaste – classic indicators for a tonkotsu broth. Thanks to the niboshi (dried baby sardines), which are depicted in the picture book menu and I assumed used in the soup, the stock reminded a little of the superior broths traditionally used for a good wonton noodle soup. I loved this light, different and impactful concoction Sanpoutei is using for its ramen. Another aspect that differentiates this number 3 road eatery is its in house made noodles – they are thin, flat and wavy. These kansui enriched noodles look like skinny fettuccine. These carby ribbons were al dente to start but got soft fairly quickly. I thought these uniquely shaped noodles matched the soup well but wish they stayed firm longer. 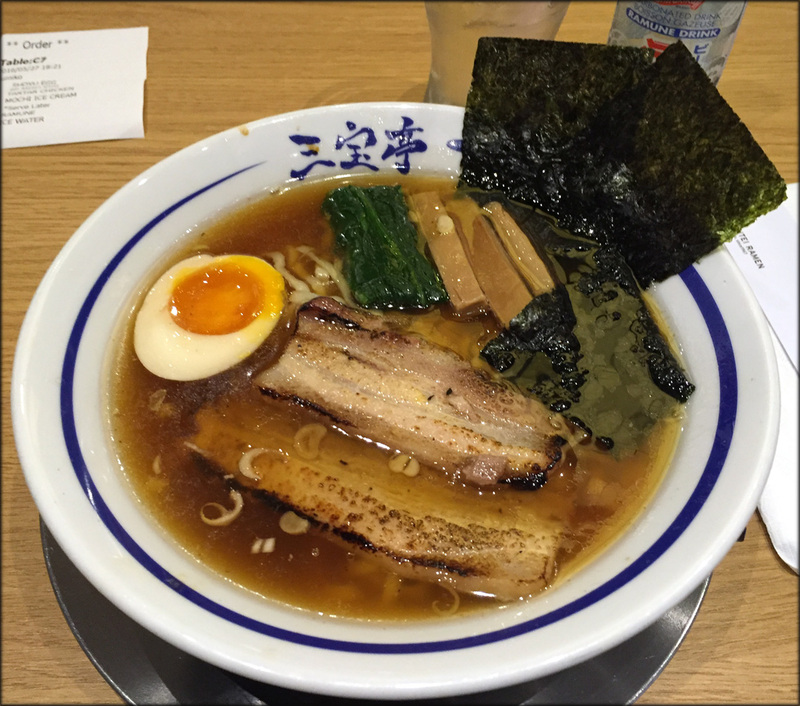 As for the toppings, there was a ramen egg, 2 slices of cha shu, bamboo shoots, spinach and nori; the first three items were notable. The Ajitsuke Tamago was good with a gooey yolk and well marinated. The cha shu was torched, giving the pork a charred taste while enhancing the fatty flavour. Lastly the bamboo shoots were not the like menma or common slices from a can but like Jenga blocks. They were perfect soup soakers but were mushy. 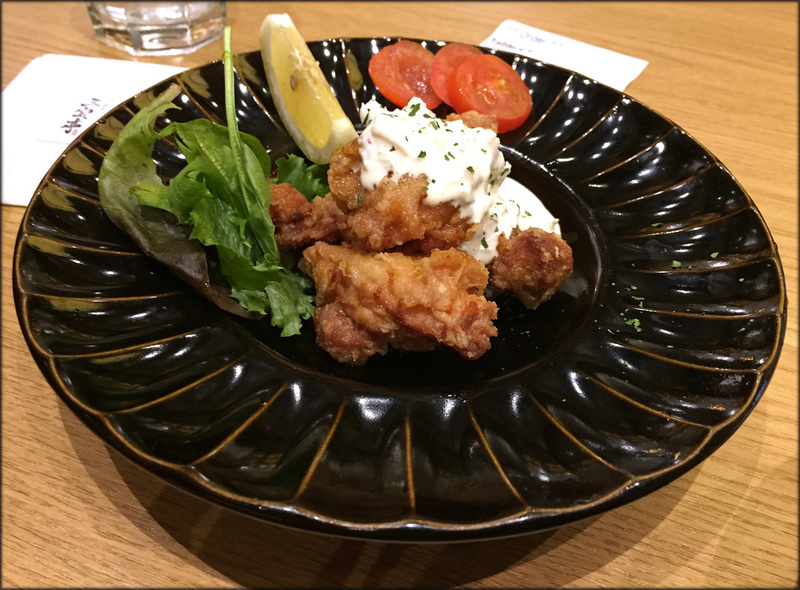 In addition to the Niigata Shoyu Ramen, we also got chicken karaage with tartar sauce. I get the appeal of creamy mayo with fried chicken unfortunately I didn’t like what Sanpoutei was serving. I thought the chicken was seasoned well but was not crispy or juicy. I found the dark meat on the dry side. Also the tartar sauce was more tangy than creamy which I wasn’t too fond of. Although I think if you like Miracle Whip over Mayo then this tartar may work for you. I prefer a concoction that’s creamy with bursts of sour. 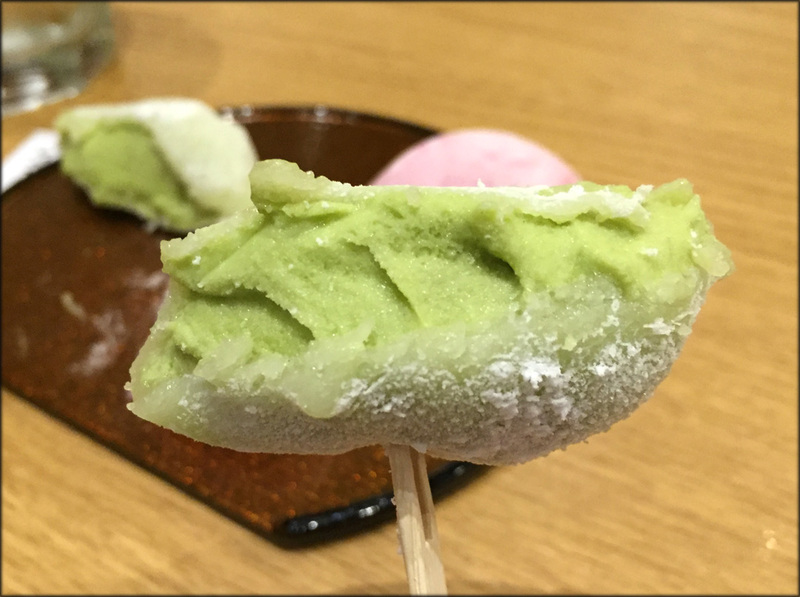 Fortunately the meal ended on a sweet note with mochi ice cream. 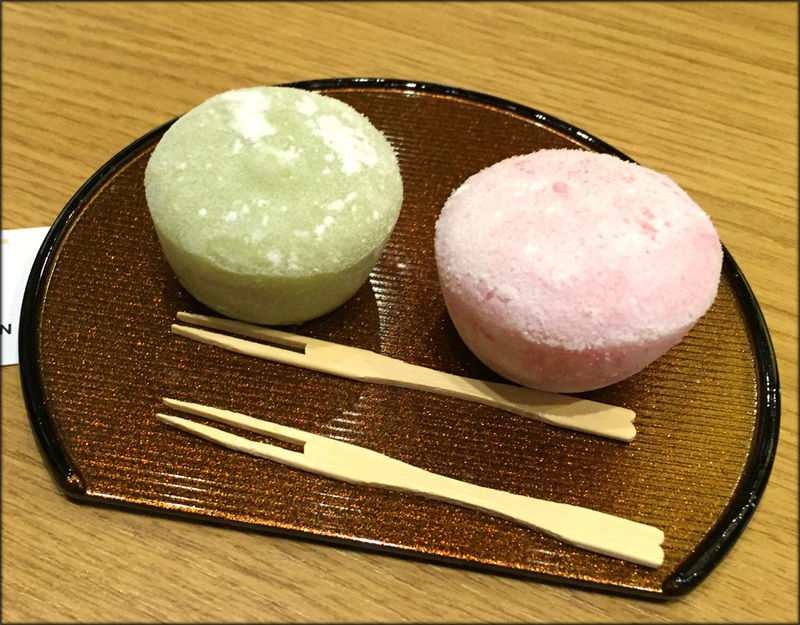 Each order comes with a strawberry and matcha flavoured mound. I like the green tea one more since it actually tasted like matcha. The strawberry one just tasted sweet without the anything notes that would make it strawberry. Overall I was happy with my first meal at Sanpoutei and I would definitely return next time I’m in the area. Currently, in order to get a good Ramen, there are only two options: Downtown Vancouver and now Richmond. To be honest, I’m surprised there isn’t better ramen in some neighbourhoods like South Burnaby (around Metrotown) and near UBC. 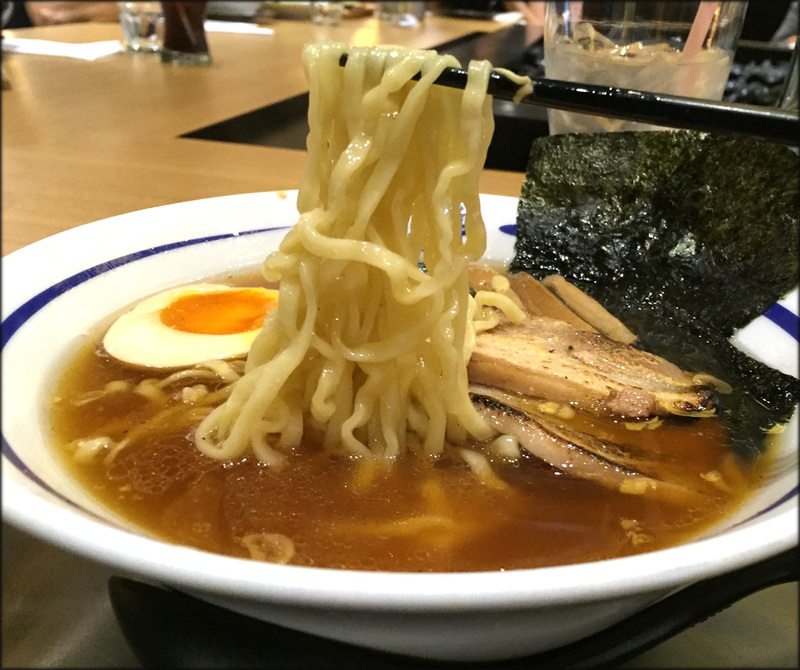 When I can credibly create top 5 lists for this kind of Ramen, or this neighbourhood or that city, then we can start talking about Peak Ramen. Previous Post Venn Can I Eat? #5 – Off Site "Meetings"